While more black and minority ethnic students are attending university, poor mental health among student populations has been increasing but, support access remains low. Research in this area has tended to focus on the treatment of existing mental health issues rather than the use of preventative strategies, such as mindfulness. Data from a focus group (n=6) of student mental health nurses were analysed using a thematic analysis approach. Participants reported a number of sources of stress relating to stigma, and study/family/ work balance. They also reported a tension between balancing western teaching on mental health issues and cultural (often spiritual) beliefs about mental illness. It was suggested that the secularisation of mindfulness may act as a barrier to engagement to those with strong religious or spiritual beliefs. BME students may not implement preventative measures if they are unable to overcome cultural stigma and the secularisation of mindfulness. There is a need to acknowledge the religious and cultural values of students from diverse backgrounds if universities hope to promote preventative mental health programmes, such as mindfulness, which are attractive and accessible to all students. The UK, Australia and New Zealand have recently engaged in widening participation initiatives, actively encouraging those from lower socioeconomic backgrounds, female, mature, and black and minority ethnic (BME) students (Australian Government, 2017; Bosanquet et al, 2012; Deasy et al, 2016). However, providing appropriate support for diverse student populations has long been identified as a challenge for universities (Kitzrow, 2003). In the UK recent figures indicate that there has been a 28% increase in requests for student counselling, with eight in ten students experiencing mental health difficulties (Nevers and Hillman, 2016) and a 210% increase in drop-out rates for students with mental health issues (HESA, 2017). At university 87% of students from BME backgrounds deny having any mental health problems (Kerr, 2013). Research into academic stress in students has tended to focus predominantly on white students in Western societies (Cole et al, 2014). 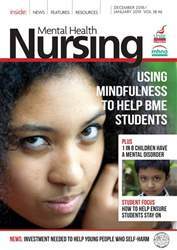 However, in the UK between 17% and 25% of nursing students come from BME backgrounds (Johnson et al, 2013), increasing to 30% for the mental health nursing pathway (King’s College London, 2009). BME students are less likely to be retained on academic programmes and are 16% less likely to receive a first or upper second class degree (Stevenson, 2012). BME students are more likely to come from lower socioeconomic backgrounds and many are primary carers for a family member, such responsibility correlates with lower levels of self-care and a diminished capacity for coping with university life (Van der Riet et al, 2015).